After the Minneapolis trip where Sherry and I saw Lyrics Born, we drove to Chicago so she could attend a class related to her aesthetician profession. While she was in class on Monday I decided to visit some record stores in the area around Lincoln Avenue. 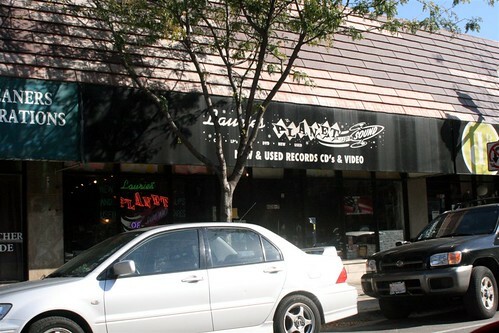 The first record store I hit was Laurie’s Planet of Sound (4639 N. Lincoln Ave., Chicago). Laurie’s is located in the area known as “Lincoln Square” which is a neat little shop area. They opened at 10AM so they were the first place I hit. In this area parking on the main streets are $.25 per hour with a 1-hour minimum. Either bring your quarters or park on a side street where the parking– albeit rare– is free. According to the guys in the store you could park for free under the El Train tracks, too. I managed to find a meter with an hour and a half still in it. The store is pretty typical record store in appearance– bins, posters, table-style CD racks. The store sells both new and used records and CD’s as well as DVDs and video cassettes. The CD racks are at the front of the store and are organized by artist name as expected. The used CD’s are interspersed with the new CD’s. The used CD’s are in thin cards that hold the cover art of the CD. The jewel cases are behind the counter. Most of the used CD’s are bunched together in their general areas. The recent arrivals are in the first row and are easy to find. This is pretty convenient and similar to the racks organized by day that Cheapo’s in the Twin Cities does. So, if you are a regular, you might only need to visit that section. The last set of CD racks are the $2.99-and-up clearance CD’s. These are CD’s that they want to get rid of for various reasons and are clearance priced. This might be because the CD’s are slightly blemished or maybe it is a promo title. I picked up my Michael Brook CD from this section. Below some of the CD racks are the dollar bins. This is kind of a grab-bag of titles that the store is looking to dump. I picked up a couple of CD’s out of these bins. I saw some gems in there that I already had, too. Most of it is questionable, but there are a lot of promotional items in there, too. The vinyl section is at the back of the store and there are two tables of new vinyl– priced fairly. Behind that is the used section with a “recent arrivals” section like the CD section does. I found the store staff to be friendly, conversational and generally very helpful. I plan to come back. Heard It On The X – Los Super 7 (CD, Telarc CD-83623, 2005)($6.99) This is the third of this series. The first self-titled Los Super Seven album on RCA was “hosted” by Los Lobos as the band as a tribute to Border Radio songs of the Tex-Mex variety. Heard It On The X has Calexico playing a similar role with some of the same performers including Freddy Fender, Rick Tervino, and Ruben Ramos from the first session. This CD adds Delbert McClinton, John Hiatt, Raul Mao, Rodney Crowell, Joe Ely and Clarence “Gatemouth” Brown. This CD features the Doug Sahm classic “The Song of Everything” which I heard Calexico do with members of Oakley Hall in Iowa City. One to add to my expanding Calexico collection. What’s Wrong With This Picture? – Van Morrison (CD, Blue Note 90167, 2003) ($6.99) On the drive into Chicago XRT played one of Van Morrison’s new albums and Sherry commented that she liked this mellow jazzy version of Van the Man. So, when I ran across this used, I thought I’d pick it up. Very decent CD. I’ll be ripping this one for the in-home mp3 server. I think that Van Morrison on Blue Note is a pretty classy combination. I hope he’s able to continue down this path. RockPaperScissors – Michael Brook (CD, Canadian Rational CRBHE002, 2006)($2.99) This one was a SCORE! I found this in the $2.99 and up bins in the back. It was still sealed. I didn’t even know that Michael Brook had a new CD. I used to listen to his 1992 release Cobalt Blue all the time. I originally found out about Brook because I was heavily into artists on 4AD (Cocteau Twins, Pixies, Xymox, Throwing Muses, Lush). Brook is mostly an ambient instrumental artist and really a guitarist. He toured with David Sylvian and Robert Fripp as a supporting musician. As I was looking into his career while writing this up, I found out that he was the composer and performer for the film “An Inconvenient Truth!” He has a companion album to this one called BellCurve that is only available through Barnes & Noble. Includes 4AD labelmate Lisa Germano as well as the late Nusrat Fateh Ali Khan on vocals. Recommended if you like Brian Eno’s ambient work, Robert Fripp’s ambient work, Daniel Lanois’ ambient work, and hate global warming. The Greatest Hits: Why Try Harder? – Fatboy Slim (CD-R, Astralwerks Promo, 2006)($2.99) This was a CD-R promo for this album which is probably the only thing anyone needs to own from the frequently spotty album releases from Norman Cook aka Fatboy Slim. I bought his first album Better Living Through Chemistry because of the breakout track “Rockafeller Skank” in 1997. I also bought the follow on You’ve Come A Long Way, Baby in 1998. Thanks to “Praise You” everyone heard waaay too much of Mr. Slim. I pretty much avoided the next couple of albums as he was sounding a lot like he was imitating Moby and the Chemical Brothers. This collection has all of the tracks anyone cares about or likely will care about. This CD adds two more collaborations with Lateef the Truth Speaker bringing the total to three– “Wonderful Night” (used in a Target commercial last Christmas), “Champion Sound” and the funky “That Old Pair of Jeans.” I wish Lateef would book some solo studio time. I love his collaborations, but he’s due for a solo rekkid. Lyrics Born is doing it and so is the Gift of Gab! Happy Holidays from EMI Music Marketing – Various Artists (CD, EMI Promo, unknown year) ($1.99) Another score. This time from the bins on the floor. This is a 13-track Christmas compilation from EMI-related labels including Capitol and Blue Note. It came in a nifty metal tin box with gift wrapping graphics on stickers. Includes a lot of tracks I already have in other places, but I couldn’t pass this one up! Nat King Cole on “Christmas Song,” Deano Martin slurring “Silver Bells,” Frank on “Have Yourself a Merry Little Christmas,” Peggy Lee on “Winter Wonderland,” “Little Saint Nick” by the Beach Boys, Bing Crosby sans David Bowie on “The Little Drummer Boy,” a sultry “I’ll Be Home for Christmas” by the Rev. Al Green. Includes an unnecessarily stiff reading of “Merry Xmas (War is Over) by the Vienna Boys Choir. Oceans Apart – The Go-Betweens (CD, YepRock Promo for YEP-2105, 2005) ($1.99) Another one from the floor. A promo for the Oceans Apart album and conveniently includes the 6-tracks from the bonus CD appended to the back of the release. The Go-Betweens were one of those rare bands that transcended genre placement. They sprung onto the scene in the New Wave early 80’s and continued to record albums up until Grant McLennan’s unexpected passing in 2006. Oceans Apart was the critically acclaimed last formal release from the Go-Betweens. I managed to not follow their career, so when I saw this for 2 bones, I figured I’d pick it up. Upon first listen, it seems pretty decent. The bonus tracks are from a concert recorded in 2004 at the Barbican Concert Hall in London. Radium – Railroad Earth (CD, RRE001 (self-released), 1995)($1.99) One from the floor bins… NOT the jamband Railroad Earth from New Jersey who is on SCIFidelity Records! I picked this up because I thought it might be related. It is not. This is a grunge-y band from the Wilmington, NC area. For some reason there are resellers on GEMM who have this listed for a lot of money ($35?!?!). I suppose being a self-released CD from a fledgling band from NC it is pretty rare. I will probably stick this out on eBay to see what happens. Overall not a bad CD, really. Just kind of dated. Everybody – Sea and Cake (LP, Thrill Jockey thrill 186, 2007) ($11.99) I finally broke down and bought this on vinyl. I had been debating this, but since TJ vinyl goes up in price as titles go out of print I figured I’d snag one. Very heavy vinyl– possibly 180g? Includes a 16-page booklet of what appears to be lyrics and charts and other scribblings and notes done on graph paper. This is one of my favorite releases from 2007, and I never get tired of listening to it. Their best release so far. Between the Incident and the Event – Adam Fitz (CD, Is What You Make iwym 001, 2007)($0) Adam Fitz is one of the employees at Laurie’s. He was working while I was there. 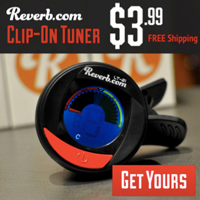 We talked about a lot of stuff music-related while I was shopping and I mentioned my blog. He asked me if I’d review his CD. I’ve given it a quick listen– not enough for a full-review– a couple of standout tracks. Decent production. He said it was singer/songwriter, which I guess it technically is, but it seems a bit more eclectic (for lack of a better word) than I would define singer/songwriter. Soulful like Adam Durvitz on a good day. Is not like Jackson Browne or James Taylor. Stay tuned for a real review. A whole bunch of Neil Young vinyl. I asked the guys from Laurie’s what record store I should hit next and they suggested I try Deadwax which is also on Lincoln (3819 N Lincoln Ave). Unfortunately when I got there it was closed. They are closed on Mondays. Instead, I hit Hard Boiled Records in Roscoe Village. 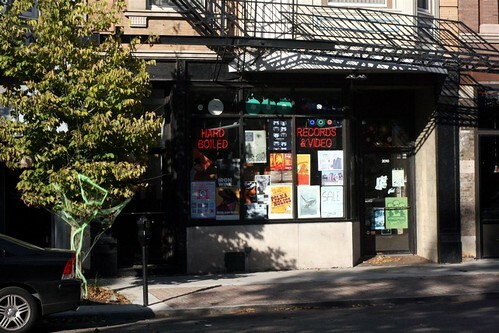 Hard Boiled Records (2010 W. Roscoe, Chicago) is not on the corner of Lincoln and Roscoe as Google Maps would have you believe– it’s in the middle of the block. With the trees in full foliage you might miss it. It is next to a bicycle store. I figured out the secret to free parking– park on a side street (duh). After a dozen laps around Roscoe Village, I found a spot. A nice little store, limited inventory, but very selectively chosen it appears. Much more esoteric than Laurie’s is. In fact, much more esoteric than any record store I’ve seen that didn’t specialize in a genre. Mark Ferguson, the owner, seems to have quite a few musical tastes in common with me, which makes this kind of a dangerous store. I’m looking for Thrill Jockey stuff and he had some. He also had a great selection of Post-Rock related titles. Mark was celebrating 11 years in business with an 11% off sale, which was cool. One thing I thought was interesting was his approach with me as soon as I came in. He asked me directly what I was looking for– a bold move if the customer wants to browse without being hassled. I told him I was looking for Thrill Jockey on vinyl. So, he came out and pulled everything he had– which he was admittedly low on at the moment, but we started talking about the bands on Thrill Jockey and he made some other recommendations and also started playing some CD’s that were from local acts that he knew where similar to the Thrill Jockey sound. Very cool. If I had hit this store before Laurie’s I might have had to stop shopping for the day! Mark has a really good selection of underground Hip-Hop and Electronica as well. According to online reviews, he has one of the best import film selections around as well. Hoshi No Koe – Nobukazu Takemura (LP, Thrill Jockey thrill 094, 2001)($9.99) Nobukazu Takemura is an renowned electronic musician and a mainstay on the Thrill Jockey. I’ve never really dug into his catalog, so I thought I’d start with this. Amazingly, still in print. 2 – KTL (2 LP, Thrill Jockey thrill 188, 2007)($19.99) Very out-of-print– limited to 1500 copies with intricate sleeve art. 180g vinyl. Thrill Jockey only released the vinyl and mp3 versions of this album. The compact disc release is under the Editions Mego label. KTL is a collaboration between Death Metal SUNN O))) member Stephen O’Malley and Peter Rehberg. Very very dark ambient electronic music. Stopsmiling Issue 31 : Ode To The South ($5.95) Stopsmiling is a magazine I hadn’t heard of before this trip. Very lushly printed vivid color and nice paper. Pretty much a literary arts magazine. This issue had a tribute to the Stax Records 50th Anniversary. So there were articles on the history of the label and some of the artists on the label including a lengthy one which had excerpts of a larger interview used in the “Respect Yourself” documentary. I’m bummed to find out that this issue should have had a 10-track sampler of Stax artists with it. It looks like for $8 I can get a back issue that includes that disc. Stopsmiling Issue 26 : The U.K. Issue ($5.95) This one I bought because it came with an exclusive Thrill Jockey sampler of eight Thrill Jockey artists covering or reinterpreting a British standard “Underneath the Arches.” Pretty cool. I think the standout versions are from Sam Prekop and Howe Gelb. It seems like almost every issue of Stopsmiling comes with a bonus something-or-other. There are usually multiple covers available as well. Shaolin Series “C.R.E.A.M” b/w “Glaciers of Ice” – El Michels Affair (7″ TS008, 2007) Okay, I’m *really* stupid for not buying this!!!! Sigh. This is tasty funk ala the Meters or Booker T and the MG’s covering Wu Tang Clan tracks. This is the first release of two releases. These guys toured behind Raekwon, adding old school live instrumentals to his show. Mark? Do you still have this one?? Hello? So, at the end of the day, it was a successful run even though I only hit two stores. I came back with some interesting stuff including things to read, which always makes me happy. I was talking with Mark from Hard Boiled about how surprising it is that there are so many record stores in a small geography. He said that is by design, really. The best way to do business is to compete, and to compete you need to be where the business is– namely around other stores. He said that if you can’t compete you shouldn’t be in business. He said that his old location in Hyde Park didn’t do very well and that forced him to move. I guess I’d never though about how the economics of record retail work. It always just seemed to me that a record store needed to bring value beyond what a Big Box retailer did or provide more service than the Internet can in having a personal expert on hand. When I look at the varied shopping experience I got just from two stores not even five miles from each other. It really seems that neither of these store are redundant– they both serve different purposes and sometimes different shoppers. Make sure to visit these store and others in this area if you happen to be in this area. These stores are what independent retail is about.